"Following these candid photography tips anyone can take great photographs of people in their natural state." Photography is a great past time for people all over the world and what better way to photograph people than in the candid way people live their everyday lives. The main trick in candid photography is to be able to photograph people when they least expect to be photographed. Candid shots can range all kinds of different emotions from happiness, sadness, anger to even humorous poses. The main thing to remember about my candid photography tips is the element of surprise. Most of the time, when people know that they are about to be photographed, they will do either one of two things. Some people like to be real hot dogs for the camera and will pose, whereas others are camera shy and will either try to hide from the camera or even some might attempt to expose your film to prevent you from taking the picture. People are different and will react differently depending on the situation. In my many travels to the former Soviet Union, I have used many candid photography tips with some stunning results. Some of these candid photos I shot in Russia and Ukraine I even used for my final art show the get my BA in Fine Arts at Indiana University Northwest in Gary, IN. One of these photos of a beggar at Moscow's Yaroslavsky's Railway Station was such a powerful shot, that even the University bought it. This is an example of how the element of surprise is essential for great shots. As a young college student, on some of my first trips to the former Soviet Union, I was exploring various different fields of photography at the time and then eventually narrowed my choice genre to be landscape and candid photography. I discovered that in Russia, Ukraine, and Belarus people in general on the street or in the market places in their natural state are very camera shy, whereas in Georgia the problem I ran into is that people are so willing to be photographed that they have the tendency to pose. Once a person poses, its no longer candid. This is why the element of surprise is so important in candid photography. The first of my candid photography tips is as mentioned above: the element of surprise. Never let the subject know that you are about to take his or her picture. 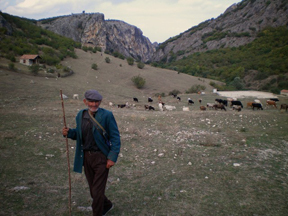 For example, look at the photo of this shepherd in the Eagle Canyon outside of Dedoplistsqaro, Georgia. Notice here that this photograph is more a natural photograph, however, the shepherd noticed that I was about to take his picture and there is a slight pose. With candid photography this should be avoided as much as possible. The best way to get good candid shots is to have a small camera that can take high quality pictures. In the days when I studied in Moscow, I had a large Pentax 35mm SLR camera which stood out like a sore thumb. Every time I would go to visit a market place or if I was on a train and wanted to take pictures of people selling their wares on the train docks of the stations the train stopped at, I was noticed rather quickly. That basically destroyed the element of surprise. A camera that is compact like the Kodak EasyShare camera is much more practical for candid photography because it is much easier to hide. Some of you might be familiar to a TV show known as "Candid Camera." This type of candid photography that that TV show featured has a more humorous note to this genre of photography. Some candid photographers like to play tricks or pranks and wait for the person to react and then snap their photograph. This is exactly what the TV show did, but the camera was a video camera, not a still camera. That's the only difference. However, video can add an interesting aspect to photography. For example, you are at a child’s birthday party and as the child opens a present. This is the perfect opportunity to snap that one shot that can be a prize winner. As the child opens the present and you snap the shot as the child’s face gleams with joy upon finding out that this present is either a toy he really wanted or whatever else it could be. This would be a great example of a candid shot. Or, suppose you set up a prank and the person reacts as you snap the picture. The best candid shots show true emotional expressions in their natural state. With these candid photography tips, you should be able to take all kinds of candid shots. The important thing to remember is that surprise is the key. These candid photography tips help capture the natural state of emotion. Facial expressions is what it is all about. Facial expressions in their natural state... be it either serious, funny, sad, etc. For example when I go to an area in the former Soviet Union and I want to take pictures of the way people live, what they do, I like to look for something unique. For example, when I was in Moscow in 1995, I took a stroll down Arbat Street and naturally I took my camera along. On the Arbat there are many artists painting or sketching portraits of people who pay them to do it on the spot. Well, I noticed something out of place and it made a great photograph. The photo is of an artist sketching a portrait of a teen-aged girl, who was holding a can of Coca Cola in her hands on her lap. You can see on the picture the artist and what the artist is sketching as well as the girl facing the artist for the portrait. The Coca Cola can is what makes this a great candid shot. The girl is well dressed and “dressed for the portrait” in a classical fashion, yet the Coke can stands out. Another candid shot I have is a photograph which I had displayed in my final show at the University to secure my degree. This shot, titled "The Little Garmonist," is of a small child near Tverskaya Street in Moscow playing a small accordion. He was singing and playing a Russian folk song with such great emotion on his face. A face bursting with joy. This is another example of candid photography. If you do intend to go practice taking candid shots, you should remember one thing. Never make yourself known to the subject. If you follow these candid photography tips, you can get some great shots, be it either of family members or if you travel to foreign countries, wonderful candid photos of the locals. This can be a great hobby because you never know what you can expect.